Near Torquay, 90km SW of Melbourne. Located overlooking the famous surf beach near Torquay. Melways Map 93, F7. 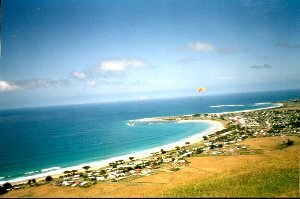 One of the most popular West Coast sites for paragliders. Beautiful, varied coastline with a sizable flyable stretch in the right conditions. Flights to Jan Juc to the NE, and Anglesea and beyond to the SW are possible in the right conditions. See also the Winkipop launch entry for information on the coast run. Weather station: Graph and near-instantaneous readings. (SE-SSW) 35m / 120ft asl. Rated PG2, recommended PG only. Park at Southside carpark and take the track at the end of the carpark. Setup and launch from the astroturf area only. Due to rotor from the cliff edge, this takeoff can be tricky for hang gliders. (E-SE) 75m / 250ft asl. Rated HG Supervised/PG2. To get to this launch, drive west past the Southside carpark turnoff for about 400 m until you see a dirt turnout with a walking track. Follow the track until you come to a meeting of five tracks. Take the leftmost one to launch. It's a fair way if you're carrying a hang glider. Top land on Southside or land on the beach below. Beware, in a high tide/high surf, this beach can get too small to safely land. Always consider your landing options. The place to go in a firm Easterly for advanced HG, this is the starting point of the Coast Run. Beautiful, varied coastline with a sizable flyable stretch in the right conditions. HG only. The local foreshore committee does not permit PGs to take off or land on Winkipop launch. The vegetation here is sensitive to trampling. Hang gliders must set up on the west side of the road then carry across. Do not set up on launch as this will jeopardise the site! It is your responsibility to ensure the gate is closed after you. Please ask spectators to keep out of the fenced off area. It is not advisable to takeoff at Winkipop in a light wind. There is no beach ... ever! Note: This launch is closed from one week before until one week after Easter Sunday while the Easter surfing competition is in progress. In an emergency you can topland on Winkipop launch (in front of the road and fence). Otherwise, land on the beaches. Southside (past Bells to the right from Winki) is the closest, but can disappear in a high enough tide. 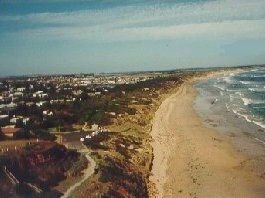 Jan Juc at the surf life saving club to the east, and Pt Addis to the west offer somewhat larger beaches. Generally you would aim to get to at least Anglesea, often with sizeable unlandable sections on the way. 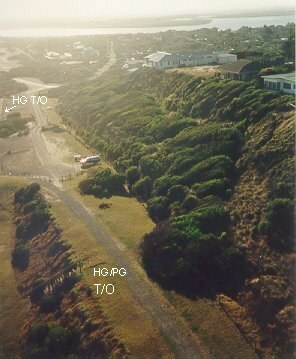 The first flights to Apollo Bay were achieved in early 1990. These are now a regular occurence in most firm Easterlies. Not yet achieved in paragliders although each season the local distance record is being broken. The flight is very difficult in various places and your first try should be with another flyer already experienced with the run. There are minimal landing areas available along the entire coast run, and even less at high tide, so treat this run with extreme caution. Be aware that these popular beaches will always have people on them regardless of the weather conditions. It is recommended that all pilots fly with instruments and UHF radio on channel 16. Be warned, highly experienced inland XC pilots have come to grief on this run. Near Warrnambool, 240km SW of Melbourne. 34km east of Warrnambool. Melways Map 100 B8. Rounded grassy ground ramp. There is a gate in the fence just behind takeoff. Top land next to the track just behind launch or in the paddocks further back. In an emergency, anywhere on top but watch out for rotor. Don't want to drive all the way to Eucla? Fly here for views of the fabulous West Victorian coastline. The beat is approx 8km long. There are no beach landings to the east once past the first bay. Do not fly the sheer cliffs if the wind is light or likely to drop off. When this site is on, there is usually rain associated with the wind direction so beware! Warrnambool, 240km SW of Melbourne. The dunes immediately right of the river mouth. Vicroads Map 90 A8. A fair walk from the roadway to the dune tops. Launch from anywhere safe. From here it is possible to fly the dunes back toward town. Whales and associated tourist aircraft during the winter months July through September. About 30km W of Cape Otway, 180km SW of Melbourne. Accessible via Lavers Hill, or from Apollo Bay. 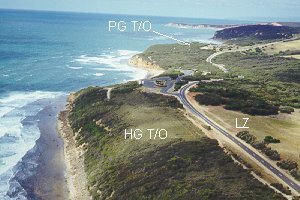 It is 10km SE of Lavers Hill, off the Great Ocean Road via Geelonga and Colac. Drive into either Red or Blue Johanna Road to the state park. Melways Map 100 H6. The area forms part of a camping reserve maintained by the Otway Shire within the Otway National Park. This site is licenced by Parks Victoria to the VHPA via the HGFA. Dunes and coastal cliffs ranging from 60' to 700' asl. The reserve has shower and toilet facilities, but no power is available. The saddle launch can be reached through the last gate on your right just before you get to the Johanna car park. The track has degraded and and requires a high clearance vehicle. It's 700m to launch at the first saddle. Be considerate of hikers, the track is part of the Great Ocean Walk. Take care to keep enough speed when launching, it can be more demanding than it looks. Dune launches from near the car parks are possible, but please consider dune erosion and minimize impact. It is relatively easy to work your way up to the higher cliffs from here. The flying varies from 80-100ft sand dunes to a 700ft coastal hill. There are some sheer cliffs approximately 350ft high in between. The dune section would only be rated as student, but the other areas would require an intermediate minimum rating. 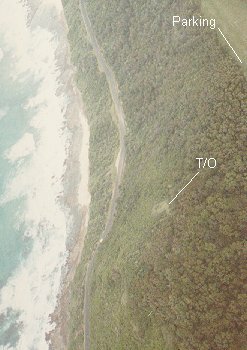 The complete flyable section would be approximately 2km long although in the right conditions the site can be, and has been flown to Moonlight Head in the west through to Cape Otway in the east. The main danger is that no landing is available at the base of the sheer cliff section, as the water is right up to the cliff at both high and low tides. It is a relatively remote area. The nearest shops are at Lavers Hill. The nearest hospital and doctor are at Colac and Apollo Bay, 65km to the north and east respectively. Warrnambool, 240km SW of Melbourne. The dunes just west of town. Coastal dunes. Access is via the gravel road past the knackery. There is a sand track that gets close to the beach and multiple dunes to launch a HG from. Warrnambool, 240km SW of Melbourne. The dunes east of the whale viewing platforms. Vicroads Map 90 A8. Scrubby coastal dunes. The preferred wind is a SSW, but up to a SW is fine too. Further to the east a WSW is doable, but it gets fairly difficult closer to the platform. Often it skews too westerly and makes flying impossible. Park at the whale watching platform, then walk down the stairs and east along the beach for 600m to a tall rounded bluff - if you look east from the platform it is the highest dune peak you see. Walk another 50m past the bluff along the beach and then up a creek track up to the nice bowl area we top launch from. Plenty of room to inflate and launch there. The launch is located 20m east of the bluff, in a nice curved alcove free from any trees and shrubs. The photo shows the view from the whale watching platform - click for a bigger version. The Bluff peak is highlighted RED, just to the EAST of it is the takeoff area, highlighted in BLUE. To get there, you walk up a track via the GREEN path, behind the trees to the top launch area. 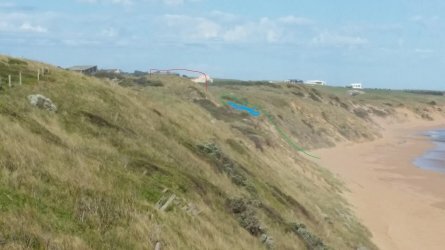 Alternatively, if stronger conditions exists, you can beach launch near the track that is halfway between the bluff and the viewing platform (just 300m east of the platform). Do not launch anywhere near the whale viewing platforms. The top launch should be suitable for hang gliders, but it would be difficult getting the glider up onto the top of the sand dunes - the track up is soft and difficult. On top there is plenty of space and shelter. Levy's Point Beach offers an alternative. From here is should be possible to fly the cliffs east of Logans Beach. Apollo Bay, 160km SW of Melbourne. Melways Map 101, C5. 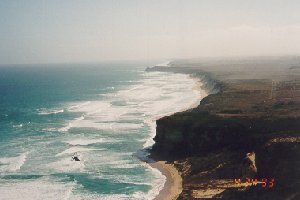 Travelling down the coast from Anglesea, 2 km outside of Apollo Bay, turn right at the signpost to Marriners Lookout and follow the road up the hill. At the end, park your car in the carpark, go through the gate (closing it after you) and follow the track about 350m uphill to its end. The present landowner requires a $7/day launch fee, payable to the trustees Bev and Neil, at the house next to car park. You must have a membership card and be appropriately rated. You will also have to sign a waiver form. Please be considerate to the public in car park and remember you are setting up on private land. Just park at the car park at the top of the road and walk up to the house. If no-one is home just fill out one of the forms in the box next to the door and leave your $7 with your form. If you don't end up flying you can get your money back. If someone is home, be nice to them, we depend on their goodwill to fly there. Large grassy coastal hill range. Good views, good thermals and the option of cross flights along the coast to the east. Cut grassy smooth ground ramp, lots of set up area. See the fees payable under 'Landowners'. Landing on the beach or in the paddocks below should cause no problems but beware of powerlines, fences and gullies. There are also power lines in amongst the pine trees just before the beach. It is possible to land on top in the right conditions, on launch or right at the top of the hill, some 150' above launch. A SE wind generally grades in strength as you go west along the coast from Port Phillip Bay, and Apollo Bay is the end of the line. The Cape Otway BOM readings can be quite different to the conditions at Marriners. On the plus side, you don't need much wind to stay up, and the site can produce beautiful thermals on the face and from the flatlands and township out front. Beware of powerlines, fences and gullies, and of snakes on the pathway. Via Wye River, 160km SW of Melbourne. Melways Map 101, F4. Until the stretch between Teddy's Lookout and the town of Kennett River was flown, Mt Meuron was regarded as Victoria's number one coastal site - if it was on! From takeoff at 450' the site rises to 600' asl over its 1km length. From Wye River take Grey River Road up the back of the hill to the west for one kilometer. There's a maintenance track on your left that takes you under the powerlines, but it's closed to traffic, so park and hike in. Follow the power poles 300m up the hill. A footpath through the bush starts on your left at S38.67255 E143.85435 - check the map. It is about 100m through the scrub to takeoff, an open area on the face. It tends to overgrow and if not flown in a while will need some maintenance to be launchable so be prepared. There are no particular dangers to the intermediate pilot except the landing. 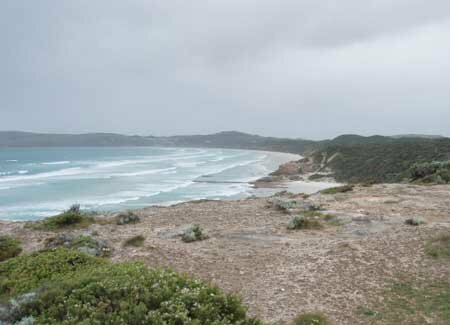 In an emergency, with the tide out, it is possible to land on what beach there is at the base, however most people land on the beach at the town of Kennet River. This requires that you fly as far east to the point as you can, then downwind to a spot landing on the beach. There is no particular difficulty. Just keep your eyes open for power lines, and people on the beach. If the wind is a little southerly, expect a little turbulence off the point. If the wind is 12 kts or stronger, it is best to land at the far end of the beach at Kennett River, to avoid the turbulence in the lee of the point. The site generates excellent lift in most winds over 10kts. Weather: The wind invariably grades in strength from Port Phillip Heads to Apollo Bay, it usually being 5-10kts lighter at Mt Meuron than at, say, Spion. So if the forecast is 15-20kts on Port Phillip it will probably be good at Meuron. Near Aireys Inlet, 130km SW of Melbourne. Just past the township of Aireys Inlet at Fairhaven near Anglesea via Geelong. Turn right at Moggs Creek off the Great Ocean Rd. Melways Map 93 C9. Parks Victoria has licenced this site to VHPA via the HGFA. Spion Kop is Victoria's most popular coastal site and very beginner-friendly. Given the right conditions it is possible to cross a large gap and fly to the larger hills to the west - more difficult for paragliders but nearly always possible for high-performance HGs. 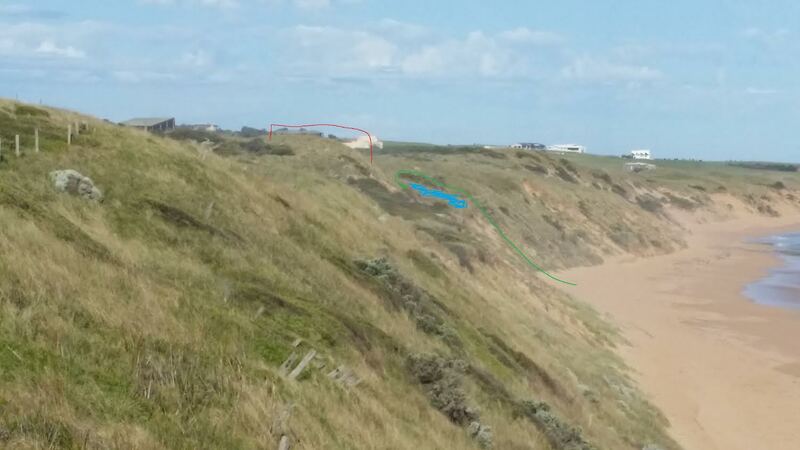 You can also fly the low 20' primary dunes at the base towards the Aireys Inlet lighthouse. As of Dec 2019, there are new rules that apply for flying anywhere along the Spion Kop, Eastern View, Fairhaven and Moggs Creek area. A notice board issued by GORCC will be displayed at the Spion Kop launch. This will give information on the location of the Hooded Plovers and general advice and requests. This will be updated daily or as necessary by GORCC and must be strictly adhered to. If you intend to fly you must first check the new notice board at Spion Kop. If you intend to beach launch from Mad Max, you must first check the notice board at Spion Kop. Under no circumstances are you to enter the dunes or launch backing up the dunes. Hefty fines apply. If it’s too light to beach launch then launch from Spion Kop. Gain at least 100ft and cross over plover areas and fly away. There is 6 kilometres of coast to play on so there is no excuse to fly anywhere near them. Familiarize yourself with our Hooded Plover rules. Pilots are required to be Spion endorsed to fly this site (including when launch at Mad Max). You can complete the Spion site specific induction with any authorised officer of the Dynasoarers. Just give them a call. The site permit allows set up only within the marked areas. This PG beach launch offers a nice alternative to the main Spion launch in stronger conditions. Do not walk through the dunes and do not kite up the dunes. As always, give marked Hooded Plover nest sites plenty of room. A maximum of four gliders are allowed on the beach at Mogg's Creek at any one time. Use a different section of beach if you must land anyway. The car park can be used as a de-rigging area if there is enough room and it does not inconvenience the public. Landings on top are banned. Typically, the wind is off a bit to the right. 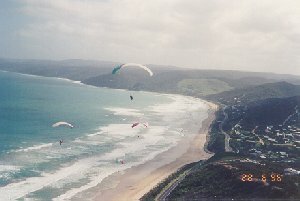 If it's straight in or off to the E a bit, hang gliders can fly around Big Hill and on to Lorne in the west. The beach is generally large, but can be very small at high tide when the surf is big. In summer, it can be full of people near the accesses - the beach is many km long, pick an empty stretch to land on if you have to. If there isn't enough beach available to safely land, don't launch. Beware of the power lines above the bridge on your landing approach into Moggs Creek. These lines also pass directly behind takeoff and along the highway east and west. Remember this if landing away from Moggs Creek. When flying to Lorne, be aware there are no safe landing areas between Eastern View and the Lorne township.